Thanks to digital disruption, the physical presence of Bank of America is shrinking...fast. Bank of America has 23% fewer branches and 37% fewer workers than in 2009, the bank said in a presentation on Wednesday. That trend is expected to continue. 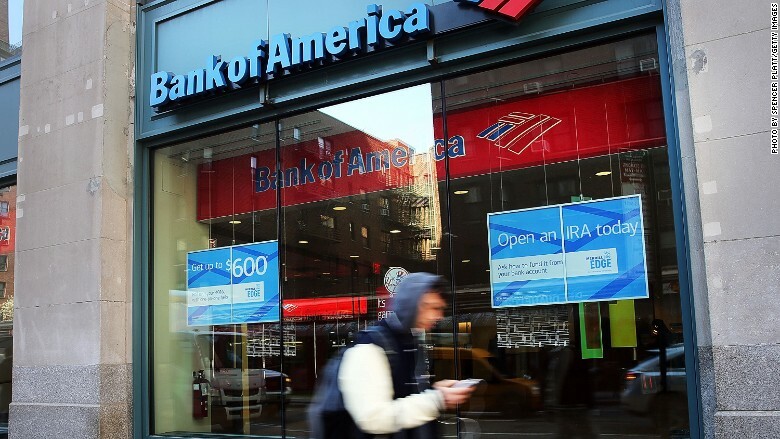 Bank of America plans to cut another 8,000 jobs from its consumer business over time, a person familiar with the matter told CNNMoney. The bank teller and back-office positions will come mostly through attrition, meaning jobs will be left unfilled when employees leave. The cuts are not imminent and will be somewhat offset by adding sales jobs, mortgage loan officers, personal investment advisers and small business bankers, the person said. BofA's plans were first reported by the Financial Times. Bank of America's shrinking headcount and branch footprint is a reflection of the powerful shift in habits by users. Instead of walking into traditional bank branches, Americans are growing increasing comfortable with banking on PCs and using their smartphones for everything from money transfers to depositing checks. Digital transactions are way less expensive and keep customers happy. In fact, BofA said it costs less than a tenth of the expenses of traditional banks. "Our strategy is putting everything on the mobile phone. If you have a thumb, you can bank," Thong Nguyen, Bank of America's co-head of consumer banking, said at an industry conference on Tuesday. "That's where a lot of our strategy is going to move going forward." 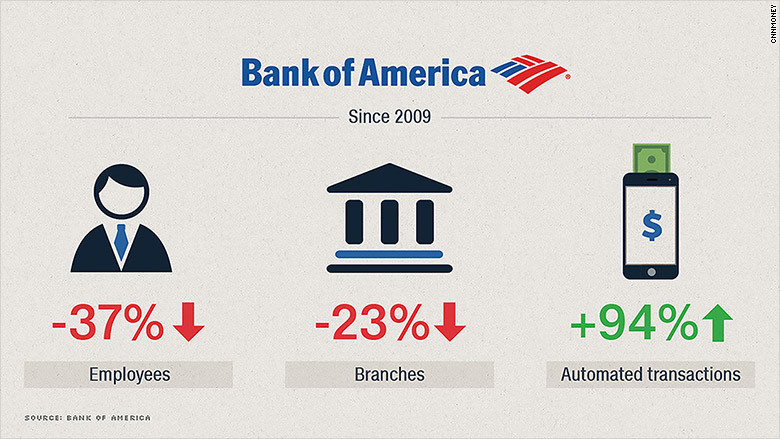 Bank of America had 4,689 branches as of the end of the first quarter, down from an average of 6,100 in 2009. A BofA spokesperson notes that some branches were shut, while others were sold to local community banks. In either case, the smaller footprint has allowed the bank to slash costs by downsizing its workforce to 68,400, compared with 107,900 in 2009. The BofA job cuts could be just the tip of the iceberg for a financial industry grappling with a wave of innovation turning the traditional business model on its head. Thanks mainly to retail banking automation, another 30% of bank jobs could be lost between 2015 and 2025, Citigroup warned in a recent report. "Fintech is forcing banking to a tipping point," Citi said. Just look at customers' habits at BofA. ATM and mobile deposits now make up 68% of Bank of America's total deposits, compared with 35% in 2009. Bank of America said it will revamp 1,500 branches soon and hundreds more each year to make them look more like Fidelity and Charles Schwab offices. "You used to come to a branch to make a deposit, a withdrawal, or payments. Now you're going to use the branch to go in and open a credit card, an auto loan, a mortgage, investment," Nguyen said. Banks have extra incentive to cut costs these days. Not only are banks coping with tougher regulation, but extremely low interest rates continue to depress profits. Shares of Bank of America, Goldman Sachs (GS) and Citigroup (C) have all plunged at least 17%. The KBW Bank Index that tracks 24 top banks is on track for its worst performance in the first half of a year since 2011. Bank of America plans to reinvest some of its savings into future technologies aimed at making digital banking better and more secure. The bank is already testing voice recognition and biometric technologies like retina scanning.